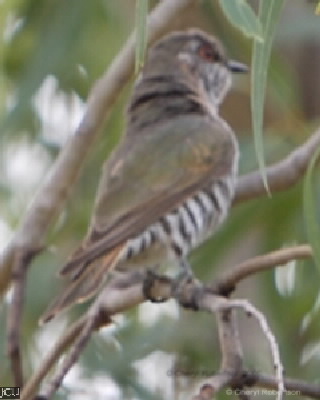 This small cuckoo about 15 cm long is found chiefly in monsoon forest such as occur in the Townsville area. The back and head are dull greenish-bronze, underparts have complete coppery-brown bars. Legs and feet are dark grey, eyes are red in the male and brown in the female, bill dark.